Clinical pathology veterinary technicians assist veterinary pathologists in the examination of animal bodily fluids, such as urine or blood, to diagnose diseases. 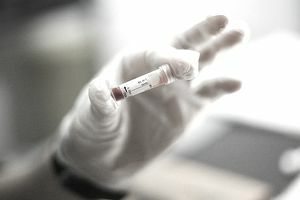 Routine duties may include assisting with biopsies or necropsies, drawing blood, collecting urine samples, preparing blood or urine specimens for evaluation, identifying the causes of diseases through observation and laboratory analysis, operating microscopes and other specialized pieces of lab equipment, and cleaning and maintaining all lab equipment. Vet techs, including clinical pathology techs, may have to work some evening, weekend, or holiday hours, depending on the needs of the laboratory staff schedule. Techs must also be constantly aware of the inherent risks involved with working with animals and take proper safety precautions to minimize the potential for injury. Care must also be taken while using the various toxic or noxious substances that may be necessary for laboratory preparations. Clinical pathology veterinary technicians may find employment in a wide variety of laboratory settings including clinics, diagnostic labs, academic institutions, research facilities, and government or private industry labs. Veterinary technician specialists may later choose to move into other animal health industry roles, such as veterinary pharmaceutical sales or veterinary laboratory equipment sales. There are more than 160 accredited veterinary technician programs in the United States that grant two-year Associate degrees to graduates. After graduation from an accredited program, vet techs must pass a licensing examination in their state of residence. State certification is achieved through the National Veterinary Technician (NVT) certification exam, though some states have additional requirements that must be completed before a license is granted. The National Association of Veterinary Technicians in America (NAVTA) is the organization which oversees the 11 veterinary technician specialist (VTS) areas of certification. The currently recognized specialties for veterinary technicians are anesthesia, surgical, dental, internal medicine, clinical pathology, emergency & critical care, behavior, zoo, equine, nutrition, and clinical practice. Clinical pathology was first recognized as a VTS specialty in 2011 and is the newest of the specialty certification areas. The Academy of Veterinary Clinical Pathology Technicians (AVCPT) offers the VTS specialty certification exam to licensed veterinary technicians after they have completed at least three years (4,000 hours) of experience in the field of clinical pathology as well as 40 documented hours of continuing education in clinical pathology. Additional requirements to sit for the exam include completion of a skills log, maintaining a case log during the third year of experience, completion of five detailed case reports, and submission of two letters of recommendation from professionals in the field. Veterinary techs that are able to fulfill these requirements are eligible to take the AVCPT certification exam. Laboratories may show a preference for job applicants that have specialty certification in the field of clinical pathology, as these individuals have proven an advanced level of skill in the field. While the Bureau of Labor Statistics (BLS) does not collect data for the individual vet tech specialties, it does report that the mean annual wage for the broader category of all veterinary technicians was $31,030 ($14.92 per hour) in 2010. The BLS survey indicated that in the category of veterinary technicians and technologists, the lowest 10 percent of all techs earned a salary of less than $20,500 per year, while the highest 10 percent of all techs earned a salary of more than $44,030 per year. Benefits packages for clinical pathology veterinary technicians may include salary, medical and dental insurance, a uniform allowance, and paid vacation days. As with any position, salary is commensurate with levels of experience and education. Specialists usually can command higher end salaries due to their significant expertise. According to the Bureau of Labor Statistics, there were 69,870 veterinary technicians or technologists working during the most recent salary survey conducted in May of 2010. The BLS survey indicated that there would be a steady year-to-year growth for the profession as a whole, with approximately 3,800 new licensees expected to enter the field each year. The BLS survey also pointed out that the rate of growth for the profession will expand at 36 percent from 2008 to 2018, much more quickly than the average for all professions. The limited number of new veterinary technicians is not expected to meet the strong demand from veterinary employers, and the extremely limited number of certified vet techs in the specialty of clinical pathology should ensure very strong job prospects for those that are able to achieve this specialty certification.